It is easy to look at American motocross today and think that we were always awesome at the sport, but in fact we weren’t. Back in 1968 we needed help. And that help came in the form of European Grand Prix riders who came to America to show the long-haired teenagers of the time what the sport was all about. Thanks to Peter Lampuu, Lars Larsson and Pierre Karsmakers, Americans learned the ropes. They studied under these European masters, worked hard and eventually beat them—and then went on to beat the world. But, it took 13 years before American riders got the respect of the European Ironmen. The Kuwaiti riders get the same joy out of racing that their American and European counterpart do—they are just off the beaten path of motocross stardom. MXA’s Dennis Stapleton is trying to do in the Arabian Peninsula what Larsson, Karsmakers and Lampuu did in the USA. Dennis teaches motocross schools, rides the Arab Nationals and has groups of young Kuwaiti motocross racers come to America to see what the sport is really like through his Stapo MX program (at www.facebook.com/stapomx). Thanks to Stapleton’s efforts and his SoCal training camps, Kuwait is leading the way in spreading motocross to a totally new market. In the break between the MTA World Vet Championship and the "Day In The Dirt," Dennis flew to Kuwait City to spend time with this young charges. He also raced with them at round one of the Kuwait National Championship. Yes, Dennis won, but what he is really looking for is the day when one of his students beats him. It took us 13 years to gain respect—the Kuwaitis are already on their way. 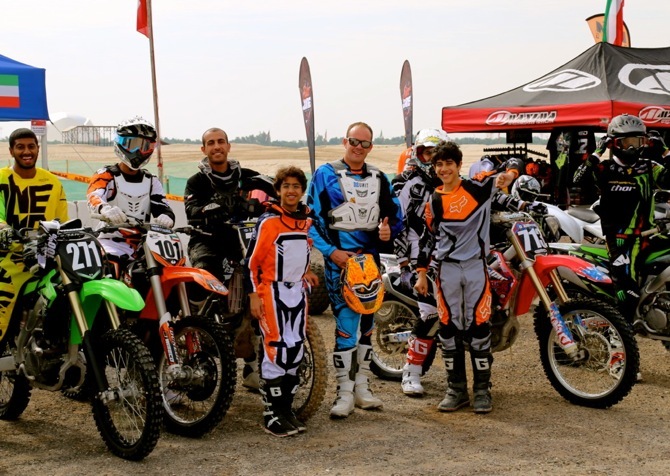 Dennis Stapleton (center) with a group of enthusiastic young riders last weekend in the desert of Kuwait. Top Photo : After the day of racing was over all of the podium finishers gathered for a group photo.